Nigeria's high vulnerability to climate change stems first from its geographical location – in the tropics and with a long coastline. Secondly, we are a developing country with little capacity to adapt to climate change due to low levels of awareness, inadequate sources of information, lack of adequare human and financial resources, and little institutional and technological capability. As a developing country, we are particularly vulnerable because a large share of our economy is dependent on climate-sensitive natural resources. The focus of this project will be the rural communities where about 70% of the population of Cross River State is located and where resources are limited and poverty is endemic. In the communities of Nsan and Betem, conditions have become appalling as a result of severe deforestation, mineral exploition and limestone quarrying. The main goal of this project is to work with these rural communities to improve their living conditions and reduce their vulnerability to climate change impacts. Strategies will include alternative and clean source of energy to address the over-exploitation of the forest for fuel wood, tree planting and establishing agroforestry systems similar to the oil palm establishment found in Betem. By the end of the project, community members will have become aware of the issues and are able to take action. Local knowledge about issues of climate change will have been documented and level of awareness about issues of global warming, their causes and effect would have become public knowledge. Also about 5,000 trees, including economic trees are planted and about 50 solar cookers will be constructed for the two pilot communities. 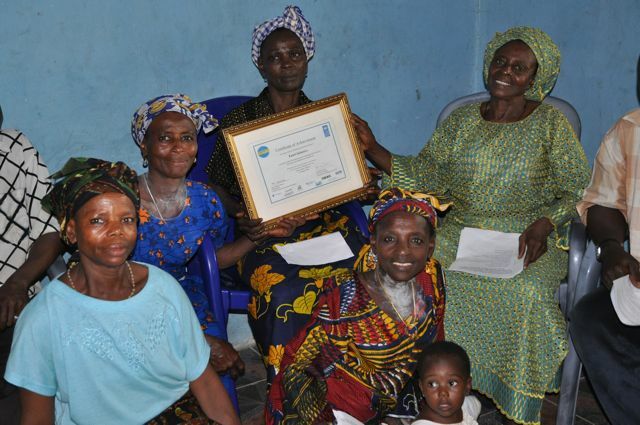 In this photo, the women's committee in Ekuri village hold up the UN award Ekuri Initiative won for its innovations in community forestry. Finding alternative, sustainable uses of intact forests is an important strategy for adapting to, and mitigating, climate change.